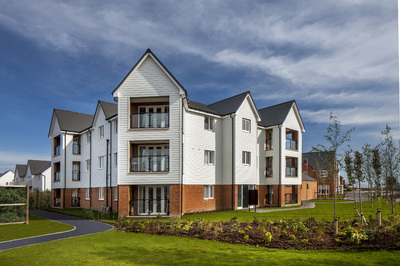 Martello Lakes enjoys an enviable position in the coastal town of Hythe, nestled between Kent’s ‘Garden Coast’ and the Kent Downs, an Area of Outstanding Natural Beauty. 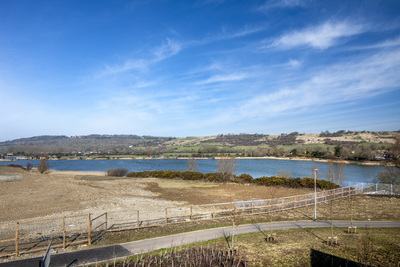 The houses and apartments have unique facilities as, in addition to landscaped green space and planned children’s play area, the development will feature a pleasure lake and a biodiversity lake on site. An exciting new development of apartments and houses, when completed Martello Lakes will feature over 1,000 new homes, some of which will have sea or lake views and balconies. The new homes are being built in a style that respects Kent’s local vernacular architecture, with a mixture of brick and timber-clad façades. Externally the homes match traditional styles, internally they have been designed with contemporary, flexible, open-plan living spaces and en suite shower rooms. A three-bedroom show home, The Barwick, is available to view. On the ground floor accommodation comprises a separate kitchen and an open-plan living/dining room with French doors opening onto the garden. Plus, there’s a WC and built-in storage space. Upstairs, you’ll find two double bedrooms, one with en suite shower room, a single bedroom and a family bathroom. Well located, Ashford International is just over 20 minutes away, connecting Martello Lakes’ residents with Kings Cross St Pancras in 38 minutes and Paris in 2 hours. The ferry ports of Folkestone and Dover are also both nearby, whilst Gatwick Airport is just over an hour away. The historic Romney, Hythe and Dymchurch Steam Railway backs onto the development and a railway halt will be provided for residents, connecting them to New Romney and Dungeness. A brand-new block of apartments has just been released, and a collection of three and four bedroom homes are currently available at Martello Lakes. Prices start at £204,995 and Help to Buy is available on selected properties. To find out more about Martello Lakes Buy, or to book an appointment to view the show home, visit barratthomes.co.uk.